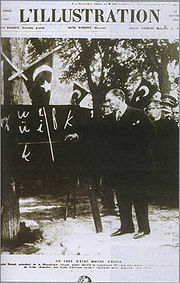 Mustafa Kemal Atatürk introducing the new Turkish alphabet, 20 September 1928. Mustafa Kemal Atatürk gave an address to the Grand National Assembly of Turkey in 1927. It is often referred to as a "speech", but this speech covered thirty-six hours spread over five days! This speech — really a presentation or address — described the events between the start of the Turkish War of Independence on May 19th, 1919, and the establishment of the Republic of Turkey in 1923. The address was originally known as Nutuk, but has since been re-named Söylev. 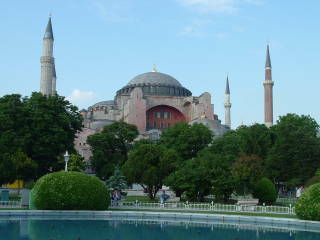 The Ayasofya (Haghia Sofia) in İstanbul. See my travel pages for many more pictures. The Turkish Language Association (TDK, or Türk Dil Kurumu), was established in 1932 under Atatürk's guidance. Its goal was to make the language of Turkey more Turkish, as odd as that may sound now. The Turkish language around 1930 was largely what we now call Osmanlı Türkçe or Ottoman Turkish, and it was heavily cluttered with Persian and Arabic vocabulary. This vocabulary shift followed and built upon the 1928 introduction of a modified Latin alphabet to replace the Persian form of Arabic script used to write Ottoman Turkish. Arabic script, Persian or otherwise, was a poor means for writing Turkish as the languages use very different sets of sounds. And an Arabic script would be a great hinderance for a country wanting to modernize and connect to the outside world. The crime reports in the newspapers are couched in language so abstruse that ordinary people listen to them as if they were religious formulae. It is ridiculous to write — "Depredators who nocturnally effected an opportunist entry into Mehmet Bey's domicile purloined costly tapis eight in number" — when what you mean is — "Burglars broke into Mehmet Bey's house by night and stole eight valuable rugs." Concepts for ordinary people to understand should be expressed in the language used by ordinary people. Imported words were banned from the press, and the TDK went about replacing the Ottoman loanwords with a mix of newly invented words based on Turkic roots and ancient words revived from Old Turkic. For example, şimal had been borrowed from the Persian for "north". It was replaced by the Middle Turkic word kuzey, derived from the Old Turkic noun kuz meaning "dark and cold place" or "shadow". The result was that the vocabulary of spoken and written Turkish started on a huge and continuing shift. The generations in Turkey started speaking very differently, and this difference has remained as the language change has continued. One of the many ironies is that Atatürk's address, originally named Nutuk but later renamed Söylev through a TDK change, has been "translated" three times so far because the original, or the latest translation, has come to sound so archaic or even foreign. He made the address in 1927, the "translations" have come out in 1963, 1986, and 1995. This isn't a perfect process. Some times the Ottoman loanword stays around, with slightly different meaning than the TDK's intended replacement. This is sort of like English having roughly equivalent words for the same concept, one derived from Anglo-Saxon and the other from Norman French. Compare the word anger, from the Old Norse angr, to the word rage, from the Norman French, or any of the other similar pairs of modern English words. For example, Ottoman Turkish dert was derived from the Persian dard — the Persian word means "pain" and was used as such in Ottoman Turkish. The TDK specified its replacement with the native Turkish ağrı, but the Ottoman and its planned replacement diverged. Now ağrı is used for "physical pain" while dert is still used for "problem" or "trouble". Some changes have simply failed. The TDK wanted to replace fırka, for "political party", with bölem. People didn't like the new alternative, and instead went with a word borrowed from French, parti. Yes, it's pronounced as if it were borrowed from the English word "party", but English got that word from France and the Turks thought of this as borrowing it from French, not English. Other times the new word stuck, but not in the intended way. Ottoman Turkish got kitab for "book" from Persian, which had taken it from Arabic. The TDK came up with betik from Old Turkic. Well, kitab is still used for "book" in modern Turkish, but betik is used in computer science for "script", as in Linux/Unix shell scripts. Here is a contemporary English translation of one paragraph of Atatürk's 1927 address. The "u" in "honoured" and the use of "shall" make this look like British English, just pointing out the difficulty of translation and the commonality of language shift. Honoured gentlemen, I shall not give an account of the notable acts of heroism shown by our infantry and cavalry divisions in pursuit of the enemy, who, vanquished for the second time, was abandoning the İnönü battlefield and retreating in the direction of Bursa, to its old positions. With your permission, however, to complete the general military picture let me summarize the movements which had proceeded in the region of our southern front. Muhterem Efendiler, İnönü muharebe meydanını, ikinci defa olarak mağlûben terk ve Bursa istikametinde eski mevzilerine ricat eden düşmanın takibinde, piyade ve süvari fıkalarımızın gösterdikleri şayanı tezkâr kahramanlıkları izah etmiyeceğim. Yalnız, umumi vaziyeti askeriyeyi itmam için musaade buyurursanız Cenup Cephemize ait mıntakada cereyan etmiş olan harekâtı hulâsa edyim. Sayın baylar, İnönü Savaş alanını ikinci kez yenilerek bırakan ve Bursa doğrultusunda eski dayangalarına çekilen düşmanın kovalanmasında piyade ve süvari tümenlerimizin gösterdikleri anılmaya değer yiğitlikleri anlatmayacağım. Yalnız, askerlik bakımından genel durumun açıklanmasını tamamlamak için, izin verirseniz, Güney Cephemiz bölgesinde yapılan savaşları özetleyeyim. That was then modernized again in 1986, and again in 1995. Bir müsellesin mesaha-i sathiyesi, kaidesinin irtifaına hâsıl-ı zarbinin nısfına müsavidir. Bir üçgenin yüzölçü tabanının yüksekliğine çarpımının yansına eşittir. As Lewis comments: Really two languages — all they have in common is the indefinite article bir at the beginning and the suffix -dir at the end. They borrowed Persian and Arabic plurals. From Arabic they borrowed the disease of language known as grammatical gender. Further, Turkish adjectives precede their nouns, but Arabic and Persian adjectives follow them. Persian interposes an i between noun and qualifier, and both conventions were adopted. The Ottoman name for the Sublime Porte, the central offices of the Sultan's government, was therefore Bâb-i-âlî, two Arabic words meaning "gate" and "high", joined by a Persian i. See Oxford professor Geoffrey Lewis' The Turkish Language Reform: A Catastrophic Success for a detailed description of the Turkish language reform from 1932 through 2002. Also see Professor Lewis' 2002 Lecture on the topic.